Innovation and continuous improvement are very important Raven values, contributing greatly to our culture and purpose every day. Raven Aerostar Engineering Technician Rich Schmit demonstrated both of these values in his outstanding work on automating machines for the production of the new Individual Equipment Carrier (IEC) Bag product. Congratulations, Rich, on being named this month's Team Member Spotlight winner! 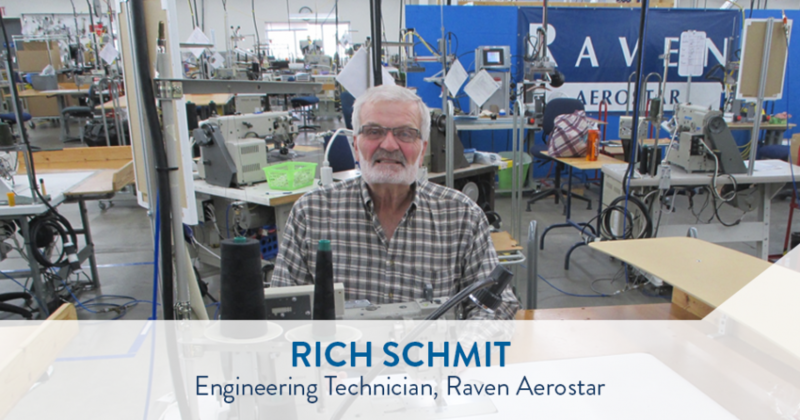 Rich played a key role in starting up automation capabilities in Raven Aerostar’s newest production line in Madison, SD, building the IEC Bag. This product line is different from all other products that they had built in the past. Because the bidding on the project was controlled by our customer, the team needed a quick solution. Rich studied the processes and drawings involved in the manufacturing of the new product, communicated with the team, and started automating the easier processes. He then worked on the more elaborate technical automation. He continuously seeks feedback from supervisors with intent to make improvements to the automated processes, making it easier for users. Rich’s knowledge gives Raven Aerostar the ability to automate the IEC Bag machines in-house. Since he is able to see how each operator handles the product, Rich is able to make helpful adjustments based on live feedback. He has completed at least seven machines, which has removed a lot of human error in complex manufacturing processes. Thank you, Rich, for your dedication to continuous improvement and innovation, helping the Madison plant operate with excellence!